In the preceding chapters we spent some time looking at handling raw geographical location information in the form of longitude, latitude and altitude data. The next step is to learn about the presentation of location information to the user in the form of maps and satellite images. The goal of this chapter, therefore, is to provide an overview of the steps necessary to present the application user with location, map and satellite imagery using the MapKit framework and, in particular, the MKMapView class. In the next chapters, this example application will be extended to make use of the Map Kit local search and directions features. The MapKit Framework is based on the Apple Maps data and APIs and provides iOS developers with a simple mechanism for integrating detailed and interactive mapping capabilities into any application. The core element of the MapKit framework from the point of view of the app developer is the MKMapView class. This class is a subclass of UIView and provides a canvas onto which map and satellite information may be presented to the user. Information may be presented in map, satellite or hybrid (whereby the map is superimposed onto the satellite image) form. The displayed geographical region may be changed manually by the user via a process of pinching stretching and panning gestures, or programmatically from within the application code via method calls and property manipulation on the MkMapView instance. The current location of the device may also be displayed and tracked on the map view. 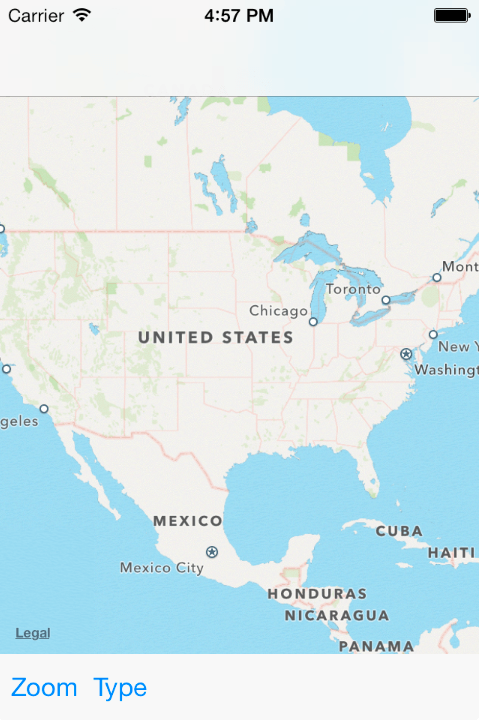 The MapKit framework also includes support for adding annotations to a map. This takes the form of a pin or custom image, title and subview that may be used to mark specific locations on a map. Implementation of the MKMapViewDelegate protocol allows an application to receive notifications of events relating to the map view such as a change in either the location of the user or region of the map displayed or the failure of the device to identify the user’s current location or to download map data. The area of the map that is currently displayed to the user is referred to as the region. This is defined in terms of a center location (declared by longitude and latitude) and span of the surrounding area to be displayed. Adjusting the span has the effect of zooming in and out of the map relative to the specified center location. The region’s span may be specified using either distance (in meters) or coordinate based degrees. When using degrees, one degree of latitude is equivalent to 111 km. Latitude, however, varies depending on the longitudinal distance from the equator. Given this complexity, the map view tutorial in this chapter will declare the span in terms of distance. 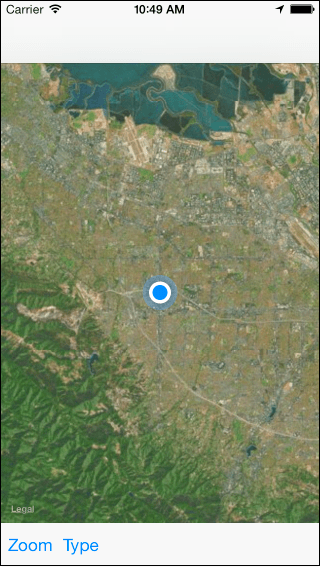 The objective of this tutorial is to develop an iOS application designed to display a map with a marker indicating the user’s current location. Buttons located in a navigation bar are provided to allow the user to zoom in on the current location and to toggle between map and satellite views. Through the implementation of the MKMapViewDelegate protocol the map will update as the user’s location changes so that the current location marker is always the center point of the displayed map region. Begin by launching Xcode and creating a new iOS project named MapSample using the Single View Application template configured either for the iPhone or iPad. Since we will be making use of the MapKit framework during this tutorial the first step is to add the framework to the project. To achieve this, select the application target at the top of the project navigator panel. In the resulting project settings panel, select the Build Phases tab and unfold the Link Binary with Libraries section. 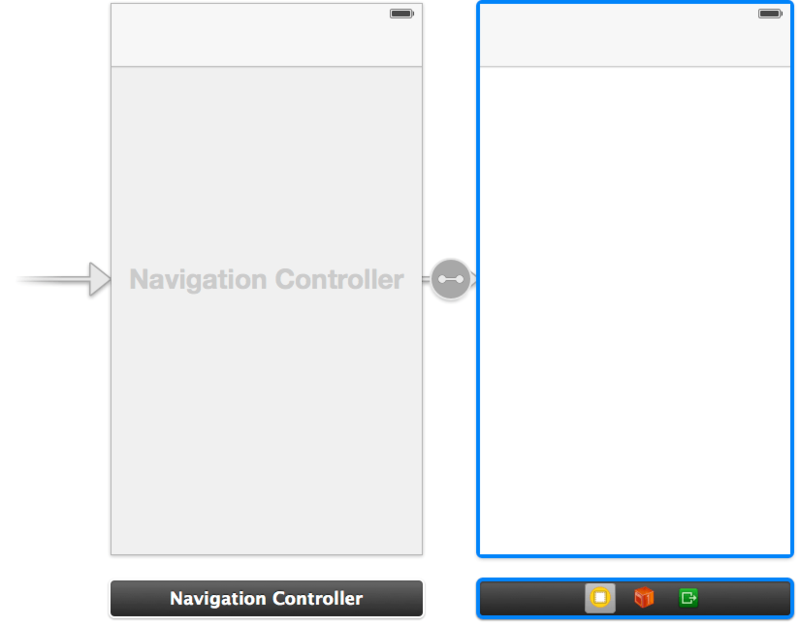 Click on the ‘+’ button, locate the MapKit.framework entry from the resulting list and click Add. The next step is to create an instance of the MKMapView class we will be using in our application and to add a toolbar instance to the user interface. Remaining in the Main.storyboard file, drag a Toolbar from the Object Library and place it at the bottom of the view canvas. Select the view controller by clicking on the status bar containing the battery indicator so that the scene is highlighted in blue. Select the Resolve Auto Layout Issues menu from the toolbar in the lower right hand corner of the storyboard canvas and select the Reset to Suggested Constraints in Map Sample View Controller menu option. Select the MKMapView object in the view canvas, display the Assistant Editor panel and verify that the editor is displaying the contents of the MapSampleViewController.h file. Ctrl-click on the MKMapView object and drag to a position just below the @interface line in the Assistant Editor. Release the line and in the resulting connection dialog establish an outlet connection named mapView. Click on the “Zoom” button to select it (note that in order to select a toolbar button item it may be necessary to click on it twice since the first click selects the toolbar parent). With the button item selected, Ctrl-click on the button object and drag the line to the area immediately beneath the newly created outlet in the Assistant Editor panel. Release the line and, within the resulting connection dialog, establish an Action method on the Touch Up Inside event configured to call a method named zoomIn. Repeat this step to connect the “Type” button to a method named changeMapType. This method performs some very simple operations in order to achieve the desired effect in the mapView object. Firstly, the user’s current location is ascertained by accessing the userLocation property of the map view object. This is stored in the form of an MKUserLocation object which, in turn, contains the coordinates of the user. Next, the MKCoordinateRegionMakeWithDistance function is called in order to generate an MKCoordinateRegion object consisting of the user’s location coordinates and a span that stretches 20000 meters both to the North and South of the current location. Finally, this region object is passed through to the setRegion method of the mapView object. Now that the Zoom functionality has been implemented it is time to configure the map type switching feature of the application. This very simple method simply toggles between the two map types when the button is tapped by the user. To get real location information, load the application onto a physical iOS device (details of which can be found in the Testing Apps on iOS 7 Devices with Xcode 5 chapter of this book). Assuming that you installed the application on a physical iOS device and went somewhere with the device in your possession (or used one of the debug location settings that simulated movement) you may have noticed that the map did not update as your location changed and that the blue dot marking your current location eventually went off the screen (also assuming, of course, that you had zoomed in to a significant degree). The delegate method is passed as an argument an MKUserLocation object containing the current location coordinates of the user. This value is simply assigned to the center coordinate property of the mapView object such that the current location remains at the center of the region. When the application is now installed and run on a device the current location will no longer move outside the displayed region as the device location changes. To experience this effect within the simulator, simply select the Debug -> Location -> Freeway Drive menu option and then select the Zoom button in the user interface. This chapter has demonstrated the basics of using the MKMapView class to display map based information to the user within an iOS 7 application. The example created in the chapter also highlighted the steps involved in zooming into a region of the map, changing the map display type and configuring a map to track the user’s current location. The next chapter will explore the use of the local search feature of the MapKit framework before extending the example application to mark all the locations of a specified business type on the map.